Drivers can no longer see the national MoT fail rates for all makes and models of cars in mainland UK, after the Driver & Vehicle Standards Agency (DVSA) ended public access to the latest MoT data records. The Government agency, which oversees the MoT system in England, Scotland and Wales, said it was “no longer able” to provide public access to the latest data due to changes in the way it records information. It also said it was unable to provide any reassurances when or if the data would become public again. 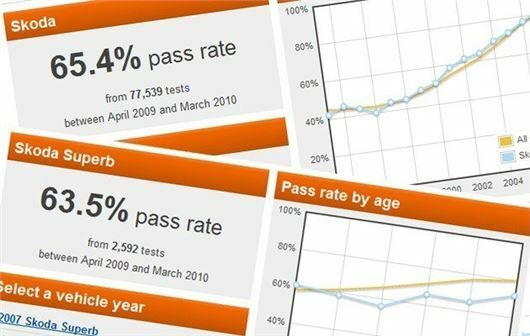 MoT pass and failure rates for the UK first become public in 2010, as part of the Government’s OpenData policy, which allows members of the public or organisations to request any recorded information held by a public authority, such as a Government department, local council or state school. However, in April 2014, the Vehicle and Operator Services Agency (VOSA) was replaced by the Driver and Vehicle Standards Agency (DVSA) and updates to the data stopped shortly afterwards. Previously, the data would be updated annually and show how often different makes and models of cars and vans failed the MoT. It would also provide a breakdown of the most-common MoT failure points. Despite assurances that updated MoT facts and figures were on the way, the DVSA has admitted - following a Freedom of Information Request (FOI) by HonestJohn.co.uk - that it will no longer be honouring VOSA's pledge to OpenData when it comes to MoT pass and failure rates. When pressed if there will ever be another MoT tests and results data set released to the public, the spokesperson said: ‘this is to be determined’. HonestJohn.co.uk has contacted the DVSA and asked them to undertake an internal review in relation to MoT data. If unsuccessful, HonestJohn.co.uk will be taking the matter up with the Information Commissioner's Office. Perhaps certain manufacturers were upset at having the information publicly available,and the right to know for the public is generally less supported than manufacturers "Right to Hide" ! A back door method to implement 4-2-2 as we will not have the immformation to respond to a backward step that the goverment want to introduce. If the system was completely redesigned, surely the ability to "produce updates to the anonymous data set" should have been part of the remit to the IT people? As with any IT design, in a nutshell there are documented 'Requirements' of how the system should be built, what a system should be able to do and what data can be extracted etc. I really cannot believe basic Requirements were not documented. IT designers cant just add or remove functionality (despite what volkswagen said for their farce) at will. I believe DVSA are simply refusing to provide the data as part of a cost cutting exercise. Typical incompetence from this load of jokers currently running the country as their fiefdom. As has been said, probably due to pressure from the motor industry. I wonder how many MOT failures are due to damage caused by the dreadful state of the UK's roads. This is utter b******s. So they re designed an IT system where they cannot anonymise the data extracted? What they really mean is to cut costs, they will no longer do the data extract. The explanation does not hold water - the DVSA holds the information as a database and can extract such information by running a set of queries. The most likely explanation is that the government is backtracking on the Open Data initiative to increase the commercial value of a privatised DVSA - the database information would then be a commodity to be sold to provide a revenue stream. A more cynical explanation would be that, with the introduction of the diesel particulate filters into the MOT test in February 2014, the DVSA was aware that the MOT failure data would clearly show that real life diesel emissions from cars were far worse than would be expected. The suppression of the data avoided the subject becoming a high profile issue until it was subsequently identified by the United States Environmental Protection Agency which has a more robust attitude to freedom of information.